Alex comes from a long line of brujas - witches - and her family expects her to take her place among them. Alex has felt some of her powers awakening but she has been keeping it a secret from her mother and two sisters because she has seen magic bring about some sad consequences. After an incident at school she can't hide the fact that she is an encantrix, one of the most powerful types of brujas, and her mother begins planning her deathday celebration. During the deathday ceremony a new bruja receives the blessings of long dead ancestors which helps to shape and control her magic. Alex decides to find a canto to renounce her powers so she can live a non-magical life but her spell goes awry and her entire family - living and dead - are taken into Los Lagos where they will be preyed upon by the Devourer. 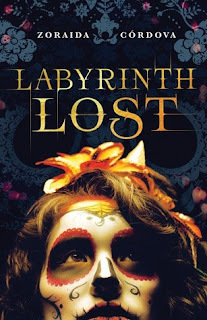 She has to enter the underworld to rescue her family with the help of a brujo she has only just met and the unexpected addition of her human best friend. I was unexpectedly loving this book for about the first third to half. Unexpectedly because it was nominated for a reading program by someone whose taste in books doesn't usually mesh with mine. I love Alex's family and the descriptions of her sisters and mom moving so easily with their magic. I could feel how they were part of two worlds and I was drawn into their lives. I love the mythology Cordova has created for this book with the dead ancestors still being around and still having jobs to do after death. Alex's family's lives felt rich and homey while the female characters were strong, powerful and beautiful. I couldn't understand why Alex would be so dead set against taking her place with these wonderful people so that was one of my first issues with the book. But then again, there has to be some conflict to make a story so of course she has to be some sort of misfit. Despite my issues with Alex, I was totally absorbed throughout the beginning of the book and even a ways into the adventures in Los Lagos. But then it all started to get too trippy for me. After finishing the book I read a bunch of reviews on GoodReads where many people referenced Alice in Wonderland for the section set in the underworld and that helped me to figure out why I didn't care for the end of the book since I am not an Alice fan nor do I like psychedelic literature. It started to fall apart for me at the section in the field with what are sort of fairy-esque creatures. But mostly, I had a hard time following where they went, how they got through the mountains, the battle scenes, the ghosts who helped them, what Alex's powers were, how they worked... It was not clearly drawn enough for me and all of that went on for too long. I wish the story had stayed in Brooklyn. Since tht didn't happen, I wish that the part of the story taking place in Los Lagos had been less frantic with well-defined events. Finally - liked the relationship that developed even though it ended up being another insta-love situation. The hints about the relationship seemed obvious to me but I think that won't be the case for many readers.